How Does Teeth Whitening in Ocala, FL Work? You’re looking at yourself in the mirror and all you can think about is your grandfather. He was a lovely man, but he smoked multiple packs of cigarettes a day, and it made his teeth a distinct yellow. You told yourself that you would never let that happen to your teeth. However, as you look a little closer, you can see that your teeth have become dull and discolored as well. Is there a way to fix this? How does it work? Dr. Daniel Weldon lets you to know how teeth whitening in Ocala, FL works to help your smile. The first thing people notice about you is your teeth. You can meet a stranger at a party and they may forget your name a few minutes later, but they will certainly recall if you had nice teeth. 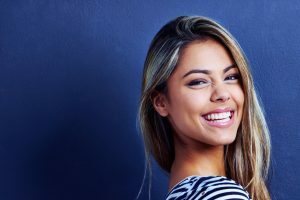 Sparkling white teeth have many positive connotations in our society, as they are often associated with people who are attractive, confident, and friendly. Years of coffee, wine, tobacco, and simple ageing can leave your teeth stained and yellow. Teeth whitening serves to fix this and revitalize your smile with one simple procedure. The secret to teeth whitening starts with the use of a bleaching gel. We use Opalescence gel, which contain potassium nitrate and fluoride. This enables it to break down the stains on your teeth, improving their color dramatically. It does this by separating the molecules that construct the stains, making them less concentrated. There are two ways you can have your teeth whitened with your cosmetic dentist in Ocala, FL. You can either have it performed in-office or use a take-home kit. The procedure in-office involves us cleaning your teeth and then applying the bleaching gel directly to them. We give it about an hour to break down all of the stains on your teeth, and you are done. It is ideal for the patient on the go. For those with a little more time, 2 easy visits will send you home with a custom made mouth tray and the bleaching gel. You simply need to wear the tray with gel for about 30 minutes a day for 2 weeks to get the full results. Our take-home kits are much stronger and longer lasting than typical store bought ones. Both procedures can easily leave your teeth looking 6-10 shades whiter, and the results can last for years with periodic touch-ups. Teeth whitening is ideal for patients who are only looking to improve the color of their smile. It is not intended to address issues such as chips, cracks, or gaps. We do offer other procedures than can address those issues, however. The bright white smile of your dreams can be yours, so be sure to make an appointment with us today. Comments Off on How Does Teeth Whitening in Ocala, FL Work?